Tehran and six leading world powers have finalized a nuclear agreement. Unless Iran breaches the deal, the International Atomic Energy Agency will confirm it. This ends decades of antagonism towards Iran. What is in store for the Islamic state? Obviously, Iran is a winner in the agreement. Tehran will reestablish economic ties with Europe. The country will have more than $100 billion unlocked in previously frozen assets. Businesses and government will have access to Western money, this includes investments and loans, Iran will also re-join SWIFT global payment system. The world’s developing economies are also interested in strengthening ties with Iran. Last week Iranian President Hassan Rouhani attended the BRICS/SCO summits in Russia to discuss various questions with Russian President Vladimir Putin, including Tehran’s joining the Shanghai Cooperation Organization after the embargo is withdrawn. Iran now has an observer status in the bloc. Sanctions’ lifting is crucial for the Iranian energy sector. Iran wants to double its crude exports soon after sanctions removal to 2.3 million barrels per day. Royal Dutch Shell, Italy’s ENI and Anglo-Swiss Glencore have already visited Tehran in May and June prior the deal. Russia’s biggest private oil firm Lukoil reopened its office in April. The country still has difficulties to overcome, as it has about $200 billion under-invested in the sector. However, this also means that Iran is open for newcomers. Germany seems to be one of the most interested in an Iranian comeback. German Vice-Chancellor Sigmar Gabriel is soon visiting Iran, as German companies want to re-enter the market worth up to $10 billion. 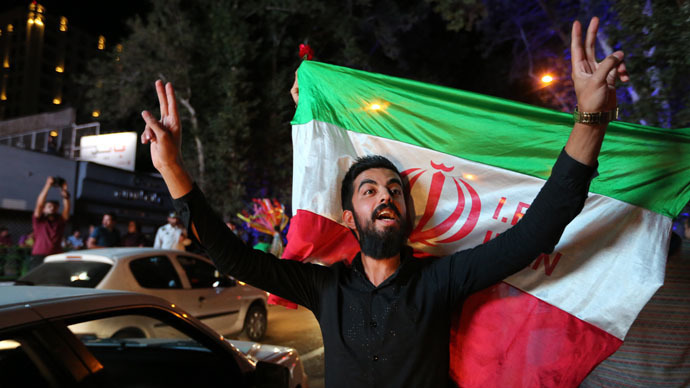 The energy sector isn’t the only one that is likely to boom in Iran. Local car production fell by 50 percent from 1.6 million in the two years to March 2014 with 100,000 workers losing their jobs in the car parts sector in recent years, according to the estimates by the Financial Times (FT). The car industry, the largest in the Middle East, and the second biggest employer in the country after oil, will regain access to investments from major car makers such as Renault and Peugeot, the key players in this market. Aircraft industry in Iran will have a new lease of life, too. According to the FT estimates, the country plans to buy more than 300 planes to refresh its civilian fleet which has an average age of 20 years. Some of them could be the US Boeings, which would be the first Boeing purchase since the Islamic revolution of 1979. Tehran will need $7.5 billion for that, buying at least 30 planes annually within next five years, says the State Civil Aviation Organization. The deal will also strengthen the national currency, the rial, which had lost a half of its value due to sanctions. A stronger rial will encourage Iranians to spend more, but the measures should be made as soon as possible, as youth unemployment has hit 25 percent, Mousa Ghaninejad, an economist, told the FT.
On Tuesday Iran and the six international negotiators (the US, UK, France, Germany, Russia and China) reached a historic deal on settling the long-term problems of the Iranian nuclear program. United Nations Security council sanctions may be re-imposed in 65 days if Tehran fails to comply with the agreement’s provisions which include granting access to suspected nuclear sites, including military ones, within 24 days to International Atomic Energy Agency, the UN watchdog.